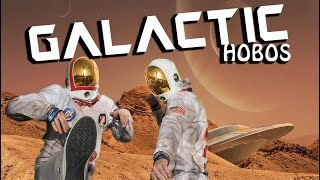 The Galactic Hobos have released 2 new singles this April for Parkinson’s Awareness month. All earnings from sales are being donated to Michael J. Fox Foundation For Parkinson’s Research. Jeff Stojak, one half of the Galactic Hobos has suffered with young-onset Parkinson's disease for over a decade. "Bringing awareness to this disease has become very important to us, but what has become even more important is bringing awareness to the fact that you can rise above it." "Pursuing our passion for music was a given — but one of us being diagnosed with Parkinson’s Disease at such a young age was something we could have never seen coming. In the years since the diagnosis one of the biggest obstacles one could ever imagine has turned into one of the biggest sources of motivation and inspiration we have. Having something with that kind of weight behind it definitely gives you perspective and focus. The realization you need to utilize the time you have to make an impact and to leave your mark on the world is a sobering one." Stutter - A future funk beast laced with the hip hop stylings of Obe G.
Don’t Call Me Baby - A big bad funky take on the classic dance track released by Madison Avenue in 2000 ft Miss Bunny Legit. Help bring awareness and speed a cure by downloading or streaming these songs. They are available now on all major music platforms. Alternatively, if you want to donate directly please feel free to use this fundraising page to do so. The facilitation of dance through music is the best medicine we have so please help us dance for a cure! One love - Together we rise!